I have been looking at many pictures of string quilts, and would like to try one. I don't really understand what to do after cutting the strips. I seen where we are suppose to have a square foundation to sew the strips too. They show using a piece of paper. It also looks like they sew the first strip in the middle of the square paper. Are these strips always machine sewed or can they be done by hand? I kept thinking I would like to sew some strips together while sitting relaxing by hand, but not sure that is done. I just don't yet have all the instructions where I completely understand the method. Can anyone give me some information to help my understanding? 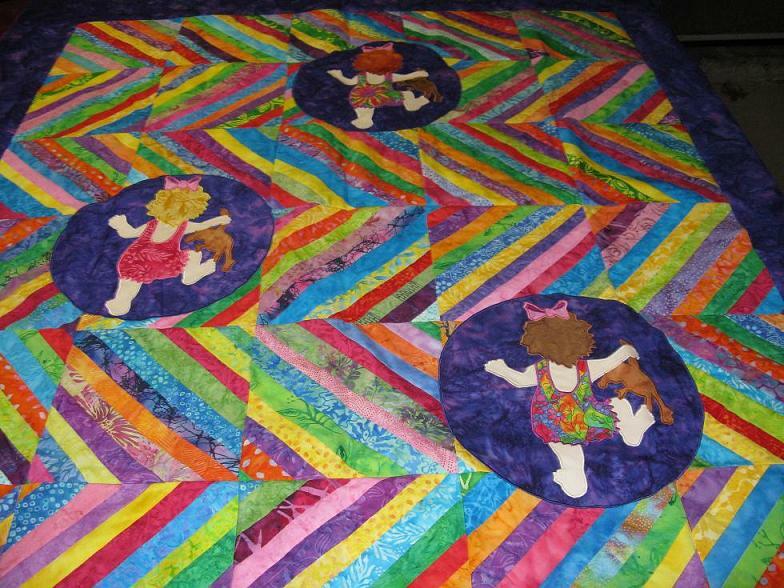 Look up quiltville or do a search on google for jelly rolls or strip quilts and click on images. Most are not paper pieced these would usually be mor intricite. Last edited by DOTTYMO; 07-18-2013 at 10:25 PM. Since it will be your quilt, you can do it anyway you want to. Mostly string quilts seem to be a way to use up scraps and it is faster to use the machine. I can't see any reason why you would have to start in the middle. Why not try one and see if you like doing it. I started doing English Paper Piecing so that I could sew something while watching baseball - turns out that I enjoy doing it. Be sure to share pictures of your blocks! I have some old string pieced blocks that were hand pieced both on a foundation of paper and on fabric. String piecing appears to have been done mostly on fabric. Difficulty with using paper seem to be the stability of the piecing and difficulty of removing the paper and getting flat blocks due to the crinkling of the paper while sewing. I might consider a light weight weight interfacing such as Pelion if I chose to hand piece. There is a missorie star quilt company utube I think. It was,erry go round or similiar . I have a puppy trying to help me type so sorry for mistakes. Paper piecing is easy once you get going. I think first step is the hardest. You'll have so much fun! What I do is to cut 8" squares of muslin, take a normal school ruler (mine is 1.5" wide) and lay it diagonally on the muslin and then draw a pencil line down each side. Next, take a strip of fabric (I use strips anywhere from 1" to 2-1/4") and lay the edge of the strip right side down against the pencil line from the middle outwards. Sew a 1/4" seam, then flip the strip to the outside. Press it down. Take another strip and lay it right sides together against the raw edge of the strip you just sewed. Sew it down, flip and press. You can work on both sides of your pencil line at once. Don't worry about color placement - my best strip quilt was made totally randomly with fabrics from my stash that I no longer cared for. You will end up with a square that has a white strip down the middle. When you have several done, your center strips will form a secondary pattern depending on our layout. Can't wait to see your blocks! one thing to keep in mind if you want to hand piece blocks---often the strips are all different lengths, stitched to your foundation- then when the foundation block is covered the block Is trimmed/squared up- so hand stitching would be cut- seams could come undone. you can still do them by hand if you want-but you will need to be more 'careful' about trimming so you don't cut through your stitching- I have done a few blocks by hand- they turn out just fine. lots of new patterns coming out using string blocks these days. fun way to use up those scraps. I've been in your shoes. When I first heard of string quilting it didn't make sense to me. That's why I had to learn about it too. There are several ways to do it. One of the most talked about patterns for string quilting works off of the middle of the square block. This creates the only uniform look to the whole quilt. You can find more information by doing a search for string quilting. I suggest using Bing. It comes back with better results than Google. I took a class and we used 8" muslin squares for the foundation. We also laid the first strip centered on the diagonal. I made a table runner with my blocks and it was gorgeous. At some point I want to do an entire quilt. Our instructor had us tear our strips and they were all different widths. This is what I did a lot with my mini string quilts, like the one in my avatar. I used really cheap muslin for a foundation. I just finished 2 string quilts. I LOVED making them. I used 8 inch square pieces of cheap muslin. I sewed a white 1.5 inch strip down the center, diagonally. I then sewed random sized strips on each side. I used a glue stick to hold each sewed piece down instead of ironing. Worked great and washed out perfectly. Thanks everyone, you have all been very helpful. I will do a lot of looking today at different images. 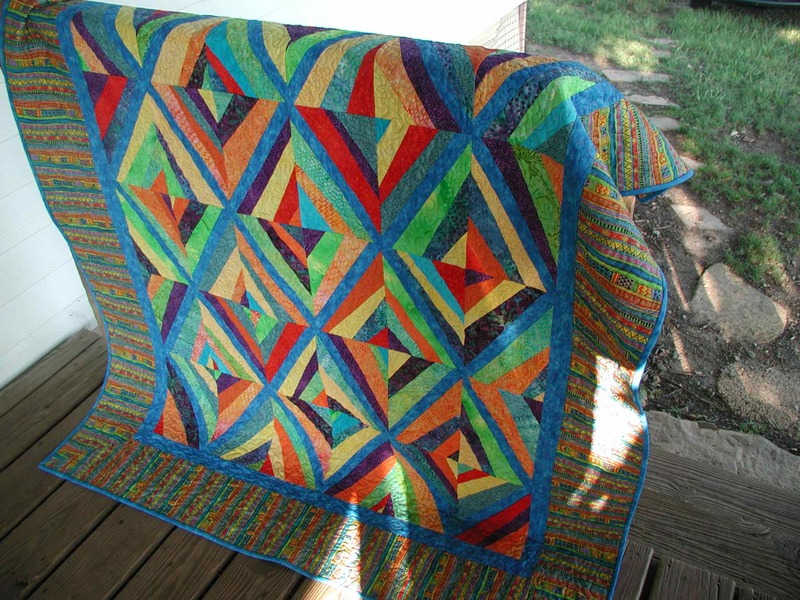 I think the string quilts look beautiful, and it is a great way to use scraps. I don't know if I really have enough scraps to do a bed size quilt which is what I would like to do, but maybe I at least have enough for a runner. I forgot to add that yes I will show you the blocks when I get some done. lol.. If you use muslin, then the top layer will be quite a bit thicker. If you use paper, you need to pull the paper off before sandwiching the quilt. I think that hand-sewn seams may distort more than machine-sewn seams when tugging the paper off. It is recommended to reduce the stitch length on the machine so the paper gets perforated more and taking the paper is easier. Another thing to remember is that the strings you add need to be a little longer than the background square. You will need to square up the block when finished. this is the one I did it is great. I use old phone book pages. Gives me 8" blocks. I also have some 12" Golden Threads paper for larger blocks. Love string quilts. "Proud Parent of an American Airman in Red Horse Squadron"
"Proud Grandparent of an American Air Force SERE"
I use old dryer sheets, as they are extremely light weight. After collecting a bunch, put them in a lingerie bag and run them thru the washer to help remove any scent or chemicals that are still in the sheets. Press them out using a pressing cloth. Usually, they are rectangles, and not squares ... but I like string quilts made with rectangles. I would like to see your quilts, got any pictures? I like the idea of the white down the middle. If you're going to do it by hand, I would use some kind of foundation or stabilizer. Check out Bonnie Hunter at Quiltville.com She works with scraps and has great tutes. I do mine on paper and don't remove the paper until the border is on. I need backgrounds for my applique and this is quick and easy. This is the first in a series. 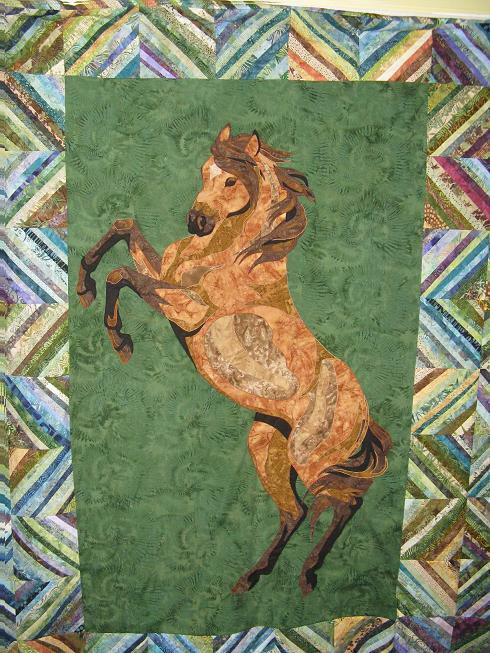 I also use it as a border as in the horse quilt. You do not have to use a foundation. Piece a square of fabric larger than your desired block size. Press and then, using a ruler of your choice size, trim to square it. I do starch the heck out of the squares. You can "wiggle" the square to get a strip to fit the middle strip as you cut. Hope this makes sense.